Do you have questions about your health or medications? 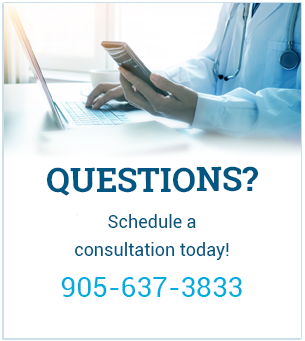 Our experienced staff is always ready to answer your questions at 905-637-3833. Brant Arts medication reviews or MedsChecks, provide an opportunity for patients to meet one-on-one with their pharmacist, helping them to identify and solve common issues related to medications. During a MedsCheck, pharmacists help patients understand drugs, strengths, adverse effects, and instructions for use while ensuring that patients are taking their medications as their doctor has directed. As part of this service, pharmacists provide patients with an accurate and complete medication list, which they may keep and take to their next physician or hospital visit, or use when travelling. All MedsCheck services are available to patients on 3 or more regular prescription medications at no charge. Contact us today for a MedsCheck. How do I transfer my prescriptions to Brant Arts? Transferring your prescriptions to Brant Arts Dispensary has never been easier! Simply call the pharmacy, provide the information listed below, and our staff will take care of the rest! Ordering refills of your prescription medications can be done by using our automated phone re-order system at 905-637-3833. Be sure to have your prescription numbers ready. Please allow 5-7 business days for refills on compounded prescriptions to be prepared. Refills can also be processed by speaking to one of our dedicated staff members. Contact us today for more information. Can I bring my meds to Brant Arts for disposal? Bring unused and expired prescription drugs, over-the-counter medications and natural health products to your Brant Arts pharmacist for proper disposal. Do not flush medicines down the toilet or sink. Disposing of your medication in the trash can lead to a child or pet finding them. The medication also has a chance of leaching into the environment when placed in a landfill. Flushing medication down the toilet can pollute our waterways. Booking an appointment does not require a referral from your doctor; however, patients must obtain a requisition for blood work from their doctor. Furthermore, we suggest women inform their doctor that they are making an appointment as a courtesy and a follow-up letter of may be faxed to their office after the visit. Learn more about our Women’s Program today. What bloodwork will I need completed for my consultation? We ask that you have hormonal blood work done prior to coming in for your initial appointment. For a full list of the required blood work, please download this PDF. I don’t want to use hormones. What other options do I have? We offer a wide range of natural and effective supplements. Your menopause practitioner can provide you with detailed information as to which supplements are best for you. They will discuss the pros and cons of hormones versus other non–drug or supplement options. The fee for a one hour consultation is $150 tax included. Follow-up visits are $75. At your initial appointment, you will have the option of paying $200. This fee will include a follow-up appointment along with your initial consult. Please refer to the “Women’s Health Consultation Checklist” for a full list of items to prepare and bring to the consultation. Please read all of the information in the “Women’s Health Program” section to better understand what is required. Visit our Women’s Health Program page for more information. Is the consultation covered by private insurance plans? If you have a health spending account as part of your private health insurance plan, it may be a benefit under “Pharmacist Consultation”. Please note: Our Menopause Practitioners are NAMS (North American Menopause Society) Certified. Does your Home Health Care Department offer any rental services? Yes, please see the list below. If interested, please contact us today. Learn more about our Home Health products & services. What products does your Home Health Care Centre carry? Are you a health care provider or do you care for a loved one at home? We’re here to help make your daily living and home care easier. The list above is a partial selection of the home health care products and services we have ready for you. Not seeing what you’re looking for? Please call us at 905-637-3833, contact us or visit us in-store. Are you able to bill assistive devices to the government? Yes, we are an ADP vendor. Please contact the Home Health Care Department for more details. Compounding is the traditional method of preparing customized medications to help meet unique patient needs. Compounded prescriptions are individually formulated often using raw ingredients. We offer both specialty compounding and veterinary compounding services. Are compounds covered under my drug plan? As compounds are individually formulated using raw ingredients, they do not always have a DIN (Drug Identification Number). A DIN is a number given to a manufactured product by Health Canada. Many compounds are covered by private insurance plans but they often require manual submission. You may need to speak to a representative at your insurance company for assistance on submission. How long will my compound take? Please allow 5-7 business days for your compound to be prepared. What conditions can be treated with a compounded prescription? Hormonal Balance (Bio-Identical Products), Peri-Menopause/Menopause, Hemorrhoids, Hyperhidrosis, Neuropathic Pain, Inflammation (from arthritis to tennis elbow), Diabetic Neuropathy, Naltrexone (Low Dose), Diabetic Foot Infection. For a full list of compounding options, please click here. Taking your medications properly is important! Remembering when and how to take your medications can be a challenging task –especially when you are taking many different prescription and non-prescription medicines. Taking your medications properly is essential for getting the full benefits of your medications, to avoid complications and side effects, and to improve your health and well-being. Our compliance blister packaging service is available in both weekly and monthly formats. We are able to add any over-the-counter medications you may be taking to your blister pack and offer complimentary delivery to ensure you never miss a dose. Contact us to take advantage of this easy to follow medication plan. During flu season, we hold weekly flu clinics in which appointments are made with the pharmacist to have your flu vaccination. Please contact the pharmacy for further details on clinic scheduling. What other vaccinations do you offer? We offer complimentary vaccination consultations to go over your personal vaccine history and make recommendations on which vaccines may be best for you. A Brant Arts pharmacist may administer vaccines to any patient 5 years of age or older for 13 preventable diseases. For example, Flu Shots, Shingles and Pneumonia to name a few. For a full list of vaccines offered, please contact the Brant Arts pharmacy team. What is Time My Meds? 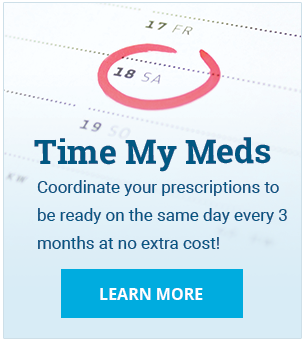 Time My Meds is a program offered to our patients that allows them to pick up all their regular medications on the same day, every 3 months. Once patients sign up, we organize all of their refills so everything becomes due at the same time. Learn more here. Time My Meds is a free service! Take advantage of this program that simplifies your medications, contact us today. Can my medications be delivered to my door? Our friendly drivers are ready to bring your prescription to your door free of charge! Contact the Brant Arts pharmacy today to set-up delivery. We offer delivery throughout the week as well as on Saturdays. Do you have an area for private consultations? Our pharmacists hold private consultations with our patients daily. Whether it be for a MedsCheck, women’s health consultation, vaccination consultation, smoking cessation or other special requests, we are happy to meet with you one on one.